Exploring Frontierville's Pioneer Trail. All the latest news, missions and information for the official expansion game. 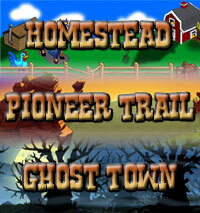 All 33 Pioneer Trail Collections and their rewards. PLEASE NOTE: The location is merely it's location on the Trail. For items that can be placed on the homestead such as Crops and Trees the collection items can also be found when tending them there. Fishing Holes are where it is AT! Get a Turkey In Yer Tummy!